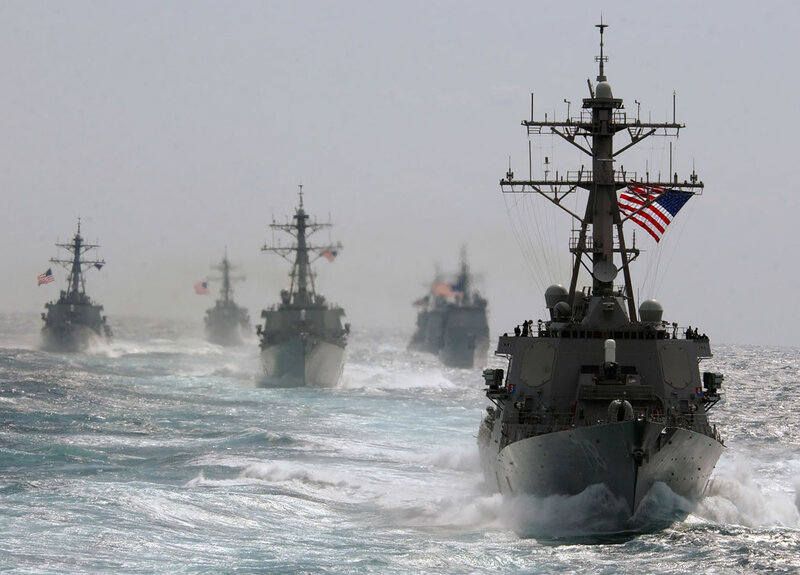 Navies like their ships to be as similar as possible – for good reason. It’s easier to train sailors on similar ships and systems, it’s cheaper to build many ships of the same design in bulk and they’re cheaper to operate and maintain. Late last year, when the U.S. Navy decided to base its next generation amphibious warship design, the LX(R), on an existing hull it cited cost savings in design, maintenance and manpower as justification. But occasionally, the mission demands something special, something unique. Throughout its history, while it developed classes of similar hulls for the bulk of its work, the Navy created several specialized platforms to test experimental capabilities or built one-offs for a unique requirement. The following list features singular ships of the service: a ship that could silently lob dynamite with pressurized air, a test bed to bring aircraft stealth to the waves and a barge with the single mission of supplying World War II sailors with thousands of gallons of ice cream. Camels being loaded on USS Comfort. In 1855, Congress approved a plan developed by Secretary of War Jefferson Davis to import camels as pack animals for the U.S. Army operating in the American Southwest. 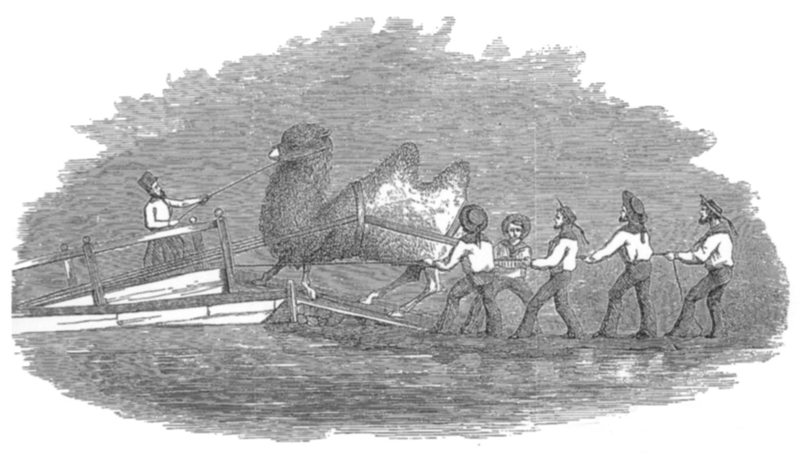 The camels were also considered for use as a long-range mounted force that could drive “hostile Indians out of the country.” The storeship USS Supply was refitted with special hatches, stables, hoists and a “camel car” for the sole purpose of loading and transporting dromedaries. Once the first herd of camels was obtained in North Africa, Supply as further modified to compensate for the towering humps of the camels by cutting away part of the main deck. The camels were delivered to Texas where their potential was recognized but the plan was never fully implemented due to the advent of the Civil War. Commissioned in 1890, USS Vesuvius was the first and only U.S. ship to be outfitted with dynamite guns. Vesuvius’ three pneumatic guns could fire 550-lbs high explosive shells at targets up to a mile away and were used during the Spanish-American War in 1898 to bombard enemy emplacements in Cuba. Since the guns quietly propelled shells with compressed air, it was reported that the enemy became unnerved because of their inability to hear any boom preceding incoming fire. Their success as a terror weapon aside, dynamite guns quickly fell out of favor due to their lack of accuracy and high maintenance needs. Vesuvius’ dynamite guns were removed and replaced with torpedo tubes. The ship later suffered the indignity of almost sinking itself when one it its torpedoes circled back and slammed into the hull. 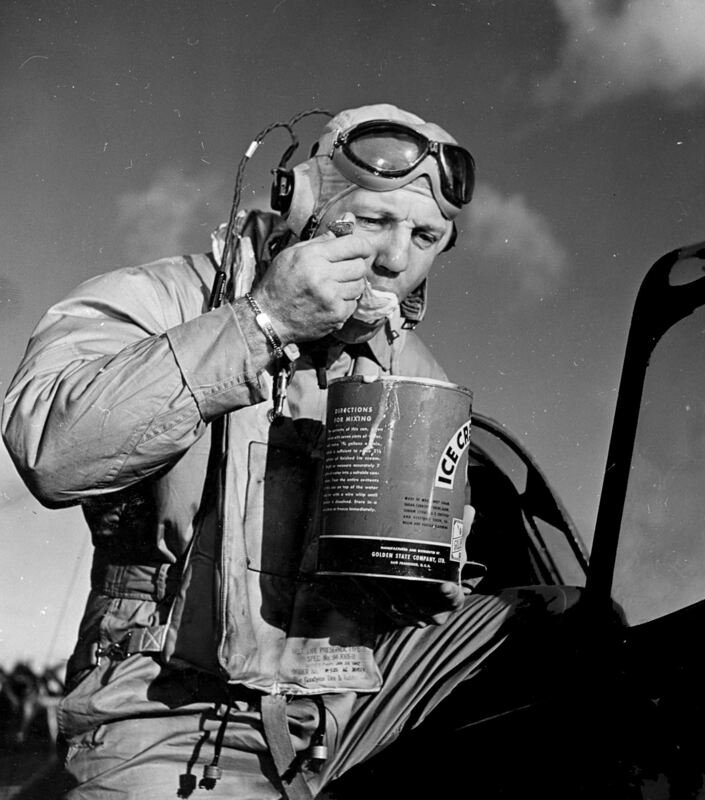 With the ban on alcohol aboard ships in 1914, the US Navy sought to offset the loss of alcohol at sea and found that ice cream was popular among the sailors. It was so popular that the Navy borrowed a refrigerated concrete barge from the Army Transportation Corps in 1945 to serve as a floating ice cream parlor. At a cost of $1 million, the barge was towed around the Pacific to provide ice cream to ships smaller than a destroyer that lacked ice cream making facilities. The Navy proudly announced that the vessel could manufacture 10 gallons of ice cream every seven minutes and had storage capacity of 2000 gallons. At a time when behemoth steel U.S. aircraft carriers and battleships dueled with the Imperial Japanese Navy, the twin-masted scow schooner USS Echo logged 40,000 nautical miles while conducting reconnaissance and delivering supplies throughout the Pacific between 1942 and 1944. 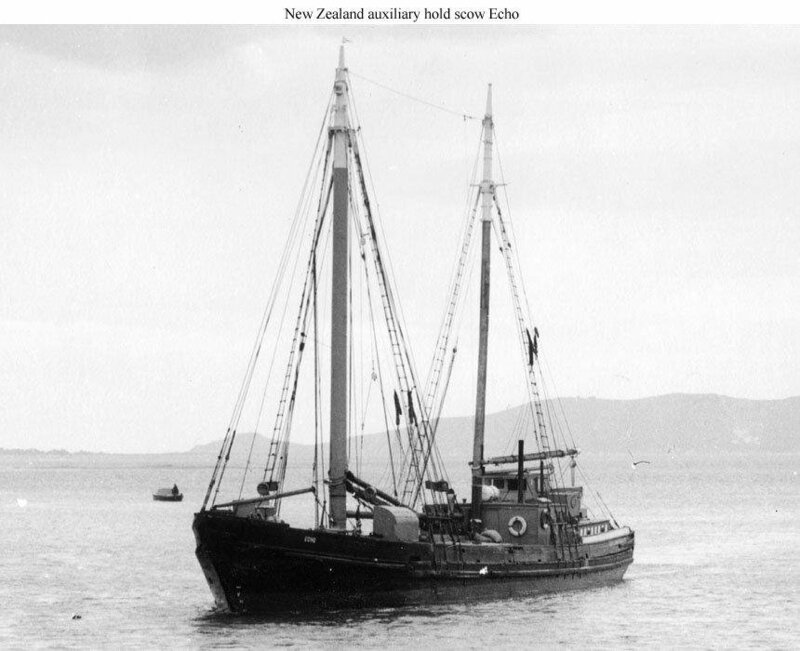 Loaned to the U.S. by New Zealand, the wooden-hulled Echo was valued for its ability to evade radar and blend in with civilian vessels while observing Japanese movements. 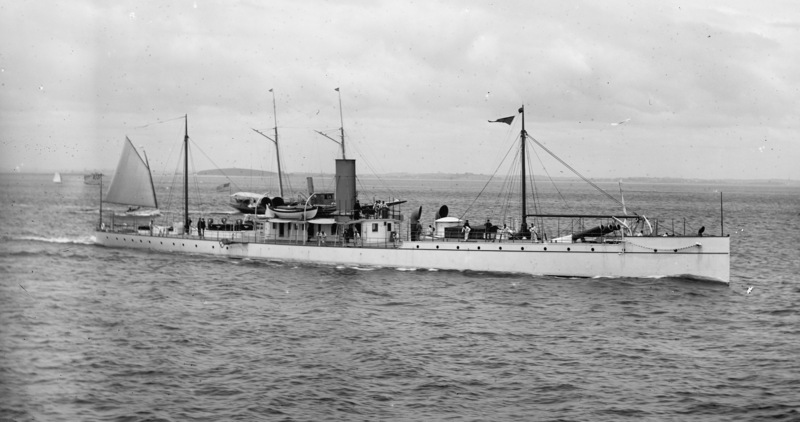 Echo was returned to New Zealand towards the end of the war and by the 1990s had fallen into such neglect that it was on the verge of being sold for firewood when it was bought and turned into a bar and museum. Ostensibly a maritime geology research ship, the Hughes Glomar Explore was actually a covert submarine recovery vessel. Built by the eccentric genius Howard Hughes, the ship was designed to raise the Soviet submarine K-129, which sank in the Pacific in 1968. The Soviets had been unable to find the wreckage of the submarine but were confident that it was at an inaccessible depth. 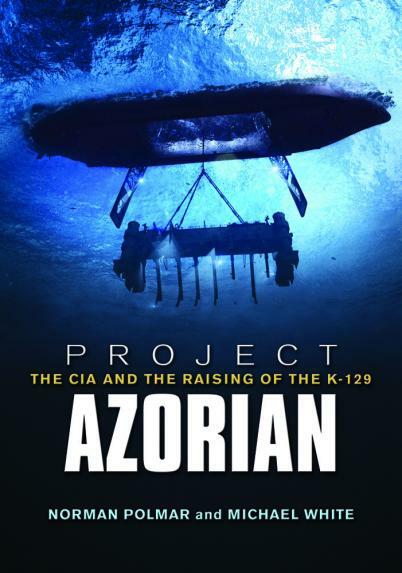 However, the U.S. Navy managed to locate the doomed sub which prompted the 1974 CIA operation Project Azorian to recover the K-129 and its valuable codebooks and nuclear missiles. While feigning a search for mineral deposits, the Hughes Glomar Explorer lowered a powerful claw from its hull to grasp the sub and bring it to the surface. The plan was succeeding until the sub snapped as it was being lifted, causing the sections with most of the secrets the CIA sought to again fall to the ocean floor and unsalvageable. Or so the CIA claims. 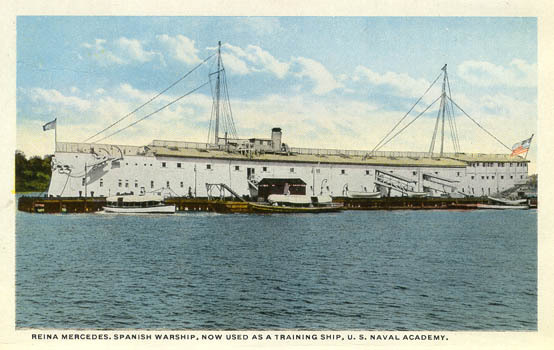 USS Reina Mercedes, housing for misbehaving midshipmen. Unlike students at other colleges, unruly midshipmen at the Naval Academy were never put on probation. Instead they were forced to live on a prison ship. That ship was USS Reina Mercedes, which had been captured in Cuba by the U.S. Navy during the Spanish American War. The prize was initially sent to Boston as a receiving ship for new recruits waiting for their first assignments. It was then transferred to Annapolis in 1912 where it served several functions including barracks for midshipmen who had committed various infractions. Although the ship was often referred to as a floating brig, rogue midshipmen ordered to live on board as punishment were not actually considered prisoners. The ship was really just a detention hall where misbehaving midshipmen had to return after completing their classes and drills. The practice ended in 1940 and the ship was used primarily as quarters for academy personnel until it was sold for scrap in 1957. As an inland, side-wheel paddle aircraft carrier, USS Wolverine might fit better in steam-punk fiction. The ship had been the world’s largest passenger side-wheel steamer when it was built as the Seeandbee in 1912. It was acquired by the Navy in 1942 and converted into an aircraft carrier to train pilots. Operating a thousand miles away from the ocean on Lake Michigan, Wolverine provided a much-needed platform for pilots to practice their take-offs and landings. Unfortunately, rookie pilots having to contend with the lack of wind of Lake Michigan and the failure of the ship’s paddle wheel to generate optimum speed resulted in the bottom of the lake being littered with Corsairs and Wildcats. To this day, 60 aircraft are still believed to be in the water. The Wolverine and its sister training carrier USS Sable were decommissioned within months of the war’s end and eventually scrapped. While not the most famous deep diving submersible NR-1 could be the most interesting. Entering service in 1969, “Nerwin” maybe the world’s smallest nuclear powered submarine. 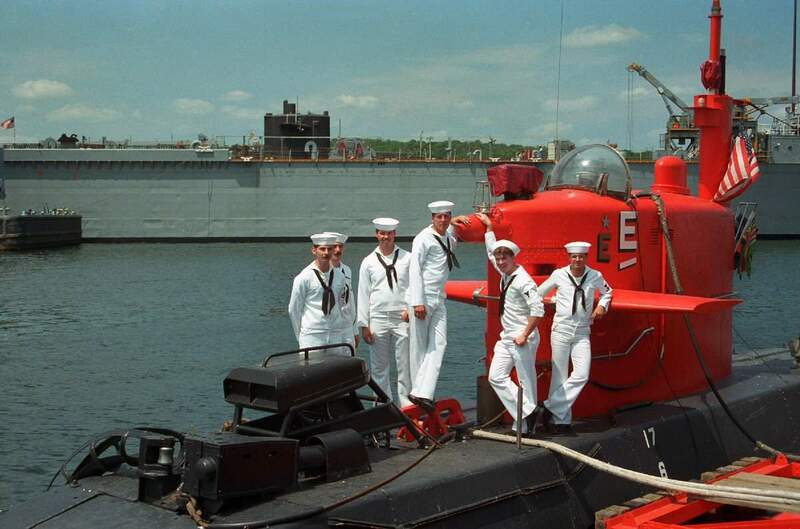 Manned by a crew of two officers, five nuclear-trained enlisted sailors and two researchers, the 400-ton boat was built to stay underwater at depths in excess of 2,000 feet and could rest on the sea floor for extended periods of time for both research and military missions. “Following the loss of the Space Shuttle Challenger in 1986, the NR 1 was used to search for, identify, and recover critical parts of the Challenger craft,” according to an archived version of the U.S. Navy’s fact file. The boat, built by General Dynamics Electronic Boat, was decommissioned in 2008. 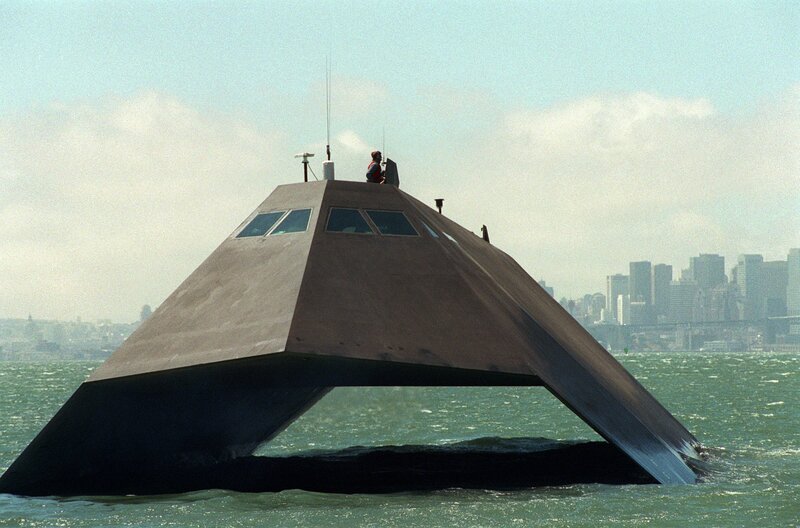 The Sea Shadow (IX-529) was an experimental ship built by Lockheed Martin in the 1980s to test the stealth technology used on the F-117 Nighthawk for possible use on submarines. “In the early 1980s, the vessel was built modularly under tight secrecy by different manufacturers and assembled inside the Hughes Mining Barge (HMB), at Redwood City, Calif.,” according to a 2003 Navy news release. The Hughes Mining Barge was developed in tandem with the ship Glomar Explorer as part of Project Azorian. The sharp angles of Sea Shadow made the ship appear smaller on radar and informed not only the design of the deckhouse of the Arleigh Burke destroyer but the ship of the antagonist in the 1997 James Bond film, Tomorrow Never Dies. The ship was based in San Diego, Calif. for years before the ship was sold for scrap in 2012. The Floating Instrument Platform was developed in the early 1960s as a stable platform for open ocean research for the Office of Naval Research (ONR). The 355-foot FLIP is towed to its research location horizontally and once in place it takes on 700 tons of seawater and goes vertical in a 20 minute process. Once its bow is in the air, almost a football field worth of FLIP is underwater, creating a more stable platform than most other research ships. The platform is designed to work in both vertical and horizontal configurations. “Most rooms on FLIP have two doors. One to use when FLIP is horizontal, and one to use when FLIP is vertical. Things like bunk beds, toilets and stoves are built on swivels and gimbals, so they will turn along with FLIP,” according to ONR. The platform – still in service – is manned by five crew and can support 11 researchers and has an endurance of about a month. 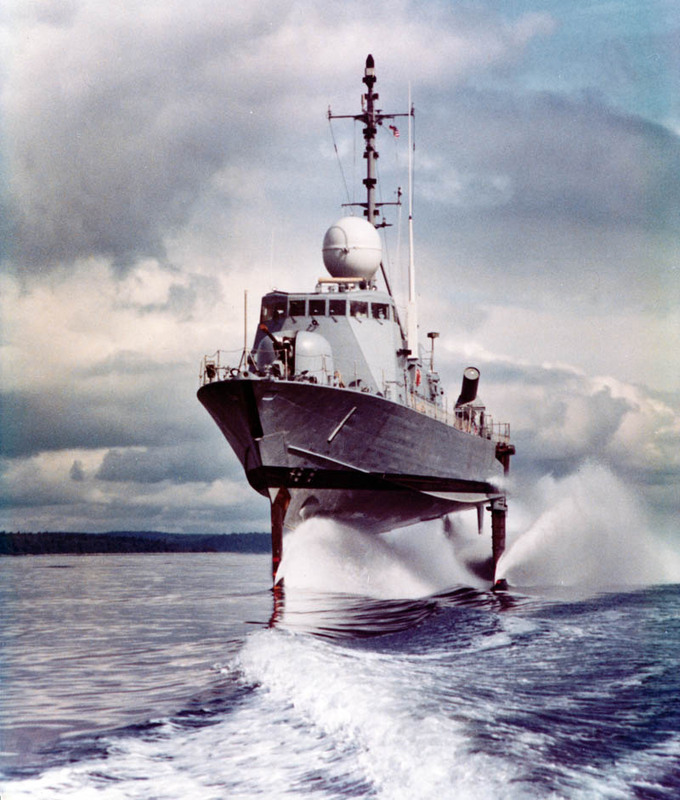 While many of the Navy’s unique ships were one-off experimental efforts, the service ordered six Pegasus-class hydrofoils in the 1970s. The effort to buy the 260-ton hydrofoils – comparatively small by Navy ship standards — was kicked off by then Chief of Naval Operations Adm. Elmo Zumwalt to beef up the Navy’s numbers of surface combatants. Armed with eight RGM-84 Harpoon anti-surface missiles and a 76mm deck gun , the Pegasus-class were designed to be quickly deployed to interdict surface threats. Riding on the foils, a Pegasus could travel at 48 kts or about 55 miles per hour. The ships were built by aircraft manufacturer Boeing and were planned for sale to allied countries. However, international interest in the program waned when the Navy halted the program in favor of heavier ships. The Navy based the class in Key West and decommissioned the ships in 1993. 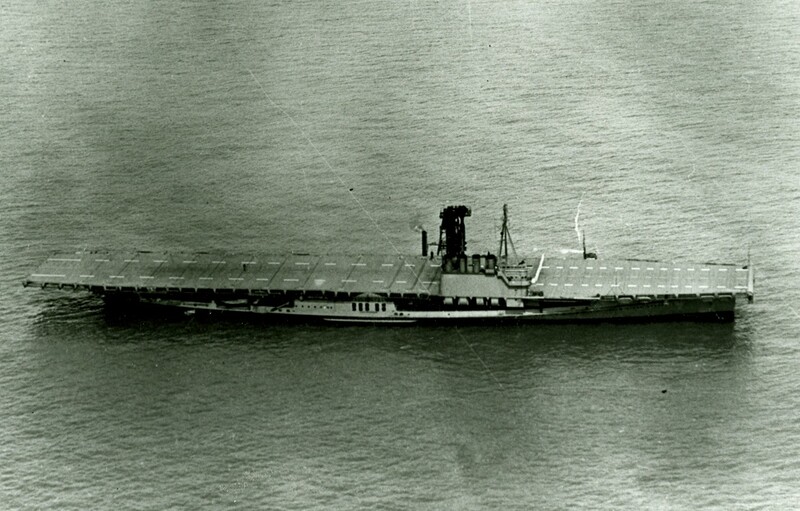 The stumpy 113-f, 160-ton Baylander (IX-514), while in Navy service, was billed as the world’s smallest aircraft carrier. With a flight deck the size of an Oliver Hazard Perry-class frigate, the Baylander served as a helicopter training for the Navy, Air Force, Marines, Coast Guard and National Guard. “Since it began service as a helicopter trainer in 1986, it has completed 120,000 error-free helicopter landings, with the record being 346 landings in one day on June 10, 1988,” read a release on the ship. Commissioned in 1968, the ship saw service in the Vietnam War and was transferred to Florida for its later training role. Since decommissioning, the ship is still in use with new civilian owners.